The challenge on PaperPlay this week is to use browns and creams only on your card/project. 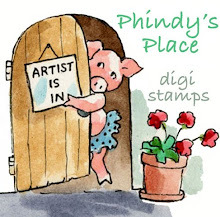 Phindy’s Place is kindly sponsoring the challenge and the lucky winner will receive a $15 gift certificate and can choose from the wonderful range available here. When I was about seven I went to ballet lessons but after a short time moved on to do something else. I still remember how much I loved twirling around in my pink tutu and flouncing up all the layers of tulle! So I was delighted to get a chance to use this adorable image, Twick or Tweet from Phindy’s Place, of a little girl trick or treating in her tutu and wings. I coloured the image with watercolour pencils and added diamond stickles to the wings and copper stickles to the tiara. Stamps: Twick or Tweet (Phindy's Place) & Flourish Background (Hero Arts). On a piece of cream pearlescent card I masked a circle for the moon, clear embossed the Flourish Background and then applied some antique linen distress ink. The ground is a scrap of card left over from another project, which has water stamping (Flourish Background) and splashing on walnut stain distress ink. I just added some tulle and a button to finish. I hope you will join us for coffee and cream this week at PaperPlay! Oh Heather.... this is so cute. Love how you used brownish colourings but got such a sweet card. Fab card Heather - love it. Sweeeet!! That little girls is just gorgeous. Wonderful colouring, love the card design. Such a cute image, Heather! Love this sweet card! oh what a sweet card, heather! i took ballet for 13 years and remember being so excited as a little girl to get my very first tutu!! Heather, this is so cute & sweet! Simply adorable. Really love this image Heather, cute,cute card love all the detail you have added!! Love the tutu-like ribbons!! You have captured the image and mood with this cute card! Your card is so sweet! Love how you clear embossed the Flourish on the background. Cute image and sweet card!